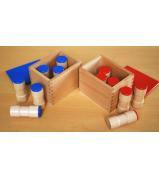 The Binomial Cube is one of those amazing Montessori materials! 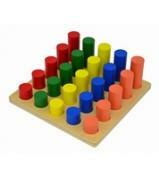 It introduces abstract maths concept to children as young as 4 without them even knowing it! 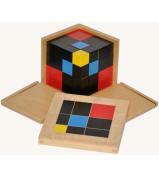 The early sensorial experience with the cube inspires them again at age 8 or 9 when they use the cube for algebra. The material provides the all-important bridge between concrete and abstract thinking. 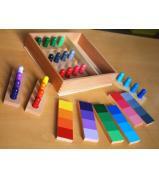 The purpose of the material is not to teach maths, but instead, to provide a challenge for a child's ability to find patterns and relationships. Therefore, the material is presented as a sensorial activity. It is presented like a three dimensional puzzle. 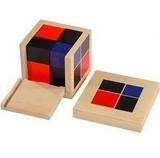 - One red cube and three red and black matching prisms. - One blue cube and three blue and black matching prisms. The square of the binomial is painted on the lid.